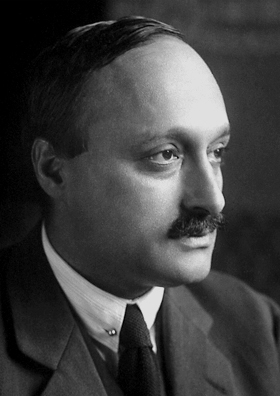 James Franck (1882-1964) was a German physicist and winner of the 1925 Nobel Prize for Physics. During the Manhattan Project, Franck served as Director of the Chemistry Division of the University of Chicago's Metallurgical Laboratory. He also served as chairman of the Committee on Political and Social Problems regarding the atomic bomb. The product of this committee was the Franck Report, released June 11, 1945, which recommended an open demonstration of the atomic bomb’s power in an uninhabited locality rather than dropping the bomb on Japanese cities. Franck was upset by the use of the bombs and after the war switched fields and studied photosynthesis. He won the Nobel Prize in Physics for discovery of the laws governing the impact of electrons on atoms, which confirmed the Bohr model of the atom. When Germany invaded Denmark in 1940, Hungarian chemist George de Hevesy dissolved the gold Nobel Prizes of Max von Laue and Franck in aqua regia to prevent the Nazis from taking them. After the war, the Nobel Society recast Franck and von Laue's awards from the solution. 1882 Aug 26th Born in Hamburg, Germany. 1906 Received his Ph.D. in physics from the University of Berlin. 1911 to 1918 Lectured at the University of Berlin.